Robert Butsch lives about thirty miles down the road from the Texas Motor Speedway, where, on April 29, CART cancelled a 600 km race for safety reasons just two hours before the green flag. The details of this strange affair may appear not to be particularly germane to Formula One, which runs no events at oval tracks. However, CART's and TMS' embarrassment held a general lesson for all forms of elite motor racing, including F1. I have never visited TMS, not being much of a fan of carousel racing, but the track's history is well known around these parts. It was constructed as a midsize oval, with two tiers of banking in the corners. The designers apparently understood from the outset that high speeds on a relatively short track might be a problem. They seemed to believe that drivers finding the steeper banking too much to handle would voluntarily confine themselves to the shallower, inside banking. In the event, the transition between the two bankings proved to be a significant hazard, and the track was re-paved to remove it. 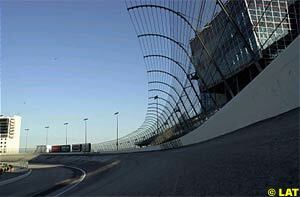 Today TMS's configuration is a one and one-half mile oval with long stretches of twenty-four degree banking at each end. It is evident that the designers were attempting to squeeze the maximum amount of speed out of the minimum amount of somewhat pricey real estate. This idea worked for a few years. Both NASCAR and the IRL have held a number of events at TMS, albeit amidst controversy over the double banking, water seepage from the track surface, a punch thrown by A.J. Foyt, the death of one NASCAR Truck Series driver, access to the track, and poor turnouts for the IRL weekends. All that came to an undignified halt when CART turned up with their high performance, open-wheeled machines. The problem sneaked up on everyone during practice and qualifying. The drivers were subjected to up to four lateral G's while cornering, and up to three and a half vertical G's as a result of the severe banking. The short length of the track dictates that the corners and the banked straights between the corners make up the majority of its length, so the drivers were under these loads for eighteen seconds out of every twenty-two second lap. High lateral G's are extremely tiring even for fit drivers. Vertical G's force blood from the brain into the lower extremities. Having to endure the two together for eighty per cent of a two hour race is asking for very serious trouble. The physics and physiology are complicated, but the bottom line is that the drivers spent too much time loaded up with too many G's. Most of them confessed to varying degrees of dizziness and blurred vision following relatively short stints at the wheel. Some had difficulty walking for several minutes after getting out of their cars. Curiously, and alarmingly, none of the drivers publicly called the track unsafe for CART cars. None said that they would not race on Sunday. Michael Andretti said after the cancellation that if the race had been run he would have driven although the prospect held little charm. The CART medical people were the ones who pushed for cancellation. What is of particular concern is that CART crossed into the danger zone without realising what was happening. IRL cars have run at TMS at only a few miles-per-hour slower than the CART cars with no untoward effects, which may have softened the vigilance of those who should have been looking out for this problem. Former IRL champion Greg Ray, after noting that IRL cars have run long distances at TMS at 226 mph (361 km/h), wondered, "Is 10 mph that much faster?" This is where the lesson for Formula One comes in. Ten miles per hour (16 km/h) may not be that much faster at 200, but it is at 226. What the TMS fiasco revealed is that racing fast cars is an exercise in nonlinear dynamics. It is amazing how quickly a seemingly trivial step up in performance can land you in deep water. Formula One would be making a mistake to think that CART's problem is not potentially their problem. In dangerous endeavours, the point when you begin assuming that everything is under control comes just before the point when you find out that it is not. F1 is the highest of racing high tech. It, just like CART, can find itself in big trouble in a big hurry if it is not constantly on guard. But what happens if you get caught napping? CART and TMS are in a great position to tell anyone who is curious what the consequences are of failing to foresee a show-stopper problem. One or both of them is going to owe someone a bunch of money. Their business relationship has soured, probably beyond recovery. They have had to endure much criticism and second-guessing. Foyt called CART "a bunch of idiots," and observed that drivers get paid to go fast. Formula One veteran Eddie Cheever, who has raced IRL cars at TMS, claimed that CART "had more than enough time" to figure out the problem in advance. However, if CART is to be criticised for failing to anticipate the events at TMS, it is nevertheless to be praised for cancelling the race, even at the last minute. One should always place good judgment ahead of money, popularity, and testosterone. Formula One history contains a classic object lesson in how to do this. Niki Lauda declined to race at Fuji in 1976 because of appalling weather conditions. It was the final event of that amazing season and he was leading James Hunt in the championship. Hunt finished just high enough in the points to take the title. If Lauda had raced and finished at least fifth he would own four championships today. At the time he probably did not know exactly why he made the choice he did. Certainly he was still feeling the psychological effects of his incredible accident at the old Nurburgring earlier in the season. Enzo Ferrari was furious with him for his decision. But Lauda is one of the finest examples around of the no-nonsense approach to life. He knew it was nonsense for him to race that day, and so he didn't. Fortunately some CART officials knew it was nonsense to race at TMS. Hopefully the high stakes, high pressure world of Formula One will remain sober enough to recognise, should the need ever arise, nonsense before it turns into disaster.